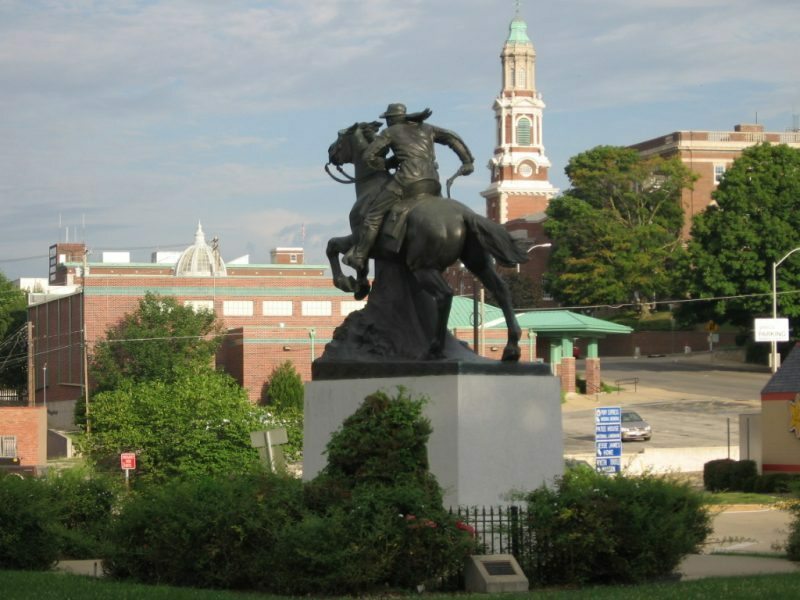 On a rainy day recently I visited MacNeil’s Pony Express statue in Saint Joseph, Missouri. I took numerous photos. After posting about a half a dozen, I realized that I omitted one rather light-hearted composition from that drizzly photo session. It shows the horse and rider as an over-sized hood ornament on my 1939 LaSalle sedan. “Lass,” the Webmasters 1939 LaSalle sizes up the 1940 MacNeil Pony Express Statue as possible hood ornament upgrade. Both metal art pieces are in their seventies. Hermon A. MacNeil’s massive 1940 Sculpture has been heading ‘west’ out of town since its installation at the origin of historic Pony Express trail across Missouri, Nebraska, Colorado, Wyoming, Utah, Nevada, to California.